What Is A Quilt Label? I get a LOT of questions about quilt labels. What are they, where do they go, why do I need one? Do you have a favorite that you've had since you were a baby? Maybe you are lucky enough to sleep under a quilt that your grandmother made. Do you know when it was made? Or why you now have it? A quilt label will tell generations to come why this quilt is important. 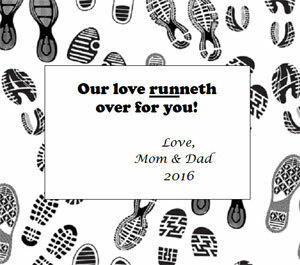 Label made for t-shirt quilt made of running/marathon tees. Why Are T-Shirt Quilt Labels Important? When you have a t-shirt quilt made for a son or daughter, of course they are going to remember that you gave it to them. Many of the t-shirts will tell the story of the quilt, but maybe not the reason you were inspired to collect those tees. The label is really for those decades from now wondering why or when this quilt was made. What was occasion for making the quilt? (wedding, graduation, Christmas, new baby etc.) Anything special going on in the world that might be an influence ? *T-Shirt Quilts of Texas includes a branding label along with a care label on the back of the quilts that they make. The t-shirts on the front of the quilt to the right, all refer to the Hoosier Burn Camp in Indiana. 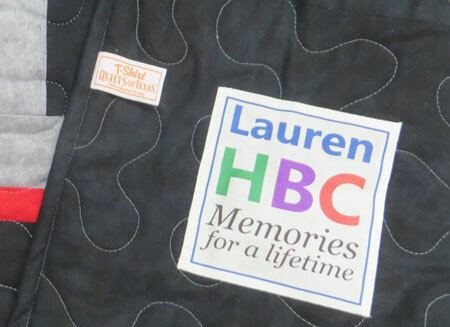 The HBC on the label was modeled after several of the t-shirts used in the quilt from many years of involvement with HBC. When deciding whether or not to include a label on the quilt you are having made you might want to consider whether the label is to just reflect a sentiment like the label on the left that talks about the loss of a loved one. 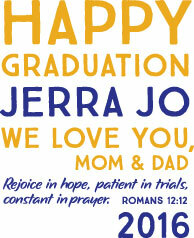 We offer labels in simple Black and White text and an outline, or a little more whimsical ones in color for occasions like graduation or grade school memories. When deciding on what sentiment that you would like included on your label, consider using the name of the recipient, the occasion, who it is from and the date. Of course you can put anything you like here - it is YOUR label. Here are some of the recent labels we have included on t-shirt quilts have been in color and have a more modern appearance. Note that it includes the occasion, who it is for, who it is from, sentiment and date. Anyone viewing this quilt in the future will know all about the quilt, from the t-shirts on the front, to the detailed label that tells a story about why this quilt was made especially for Jerra Jo. For a more abbreviated sentiment, you might consider have embroidery done (in house) for reasonable price.